Despite the association of J.R.R. Tolkien with the natural world, Middle-earth as landscape and built environment has been relatively neglected. Tolkien: the forest and the citypresents new work by some of the finest scholars in Tolkien studies, as well as research from a number of emerging scholars, addressing this neglect. Drawing on a wide variety of critical approaches, from philology to ecocriticism, in a clear, approachable style, this collection explores the interaction of culture and nature that imbues Tolkien's secondary world with the immediacy of our own. "Tolkien: the forest and the city is one of the rare books on Tolkien that manages to be both serious and accessible, avoiding the twin plagues of Tolkien criticism – defensively eulogistic fandom, and defensively arcane academicism. Essays by world experts on the subject, such as Tom Shippey and Verlyn Flieger are supported by innovative younger scholars, such as Jane Carroll and Dimitra Fimi, and between them they have produced a fine volume on the interface between nature and culture in his books. Although Tolkien's work has been widely appropriated by ecocritics, this volume, by exploring a remarkable range of Tolkien's cultural reference from the Arts and Crafts movement to the Spanish Civil War, from landscapes to food, and from deforestation to Dante, demonstrates the complexity of his intellectual positions. This is an engaging, lively, and in many ways groundbreaking contribution to Tolkien scholarship." - Peter Hunt, emeritus professor of English and Children's Literature, Cardiff University and editor of J.R.R. Tolkien: a new casebook(2013). The first time I heard about Tolkien: The Forest and the City it was a conference held at The School of English, Trinity College Dublin, on September 21st-22nd, 2012. If I'm correct, and I believe I am, this book is the conference proceedings. Helen Conrad-O'Briain was the convener at the conference. The most interesting talks were by the bigger names Michael Drout, Thomas Honegger and Alison Milbank and if I remember correct Verlyn Flieger did not make it to the event. Please do correct me if I'm wrong. A moment that most, who attended the conference, will remember is the keynote address by professor Tom Shippey. Since I don't have the book yet I'll note down the conference details below, so you can sort of see what to expect to be the contents of the book. Of course there will be a lot of editing and sometimes some papers don't make it to the final proceedings, but seeing the names who participated this book has to be highly interesting! Surely will be ordering and checking it out. Ms. Jennifer Harwood-Smith (Trinity College Dublin): ‘Fractured Cities: the Twinning of Tolkien's Minas Tirith and Minas Morgul with Fritz Lang's Metropolis." Helen Conrad-O'Briain lectures in Old English, Old Norse, palaeography and Tolkien at the School of English, Trinity College Dublin. 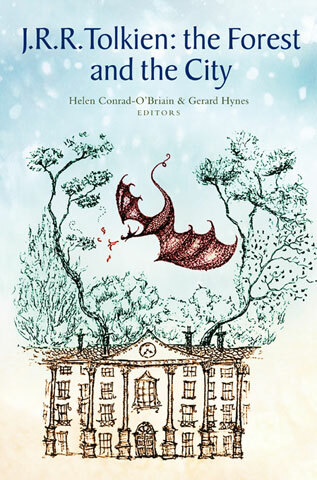 She has co-edited The ghost story from the middle ages to the twentieth century (Dublin, 2010) and has published on M.R. James, Virgil incunabulae and early insular Latin. Gerard Hynes is a Ph.D. candidate writing on Tolkien's theology of creation at Trinity College Dublin. He has taught on the Tolkien course offered as part of Trinity College's M.Phil. in popular literature and children's literature. He has published on Tolkien and geology inTolkien Studies (2012). In September 2012 he co-organized the conference 'Tolkien: the forest and the city' with Helen Conrad-O'Briain.